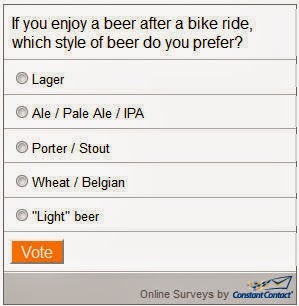 Century Cycles Blog: Online Poll: What's your favorite style of beer? With the government shutdown out of the way, our "All Hail the Ale!" NightRide on the Towpath Trail is ON! So, we asked this before our first All Hail the Ale Night Ride three years ago ... let's see if your preferences have changed! If you enjoy a beer after a bike ride, what's your favorite style of beer? Click here to take our latest online poll and let us know! Last month's poll asked "How much biking have you done this year compared to previous years?" This year's whacky weather took a toll on many of those who responded, since 43% said "I rode less than average this year." However, 31% were undeterred and "rode more than average this year." You can see the full results of the last poll here.